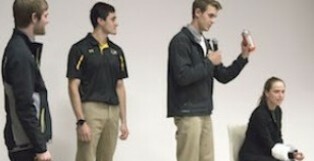 More student teams are needed for the 2019 Consumer Products Challenge at Michigan Tech. The fourth annual event takes place Thursday through Saturday (Jan. 24-26). Student teams competing in the challenge will receive a Challenge Box with items supplied by event sponsors 3M, Amway and Kimberly-Clark on Friday morning. After receiving their supplies, teams will have a finite amount of time to create a new consumer product. All Challenge Boxes include adhesive material, electronic components, absorption elements and additional sponsored products. The three-day challenge includes a product pitch, semi-final presentation and the final round. Judges will evaluate the products based on innovation, business model and its impact on the environment, society, health or safety. The University community is invited to attend the final round of competition at 2 p.m. Saturday in Fisher 139. The top three teams will receive cash prizes totalling $4,400. Participation is limited to the first 24 teams to register. Teams must consist of three to five Michigan Tech students, and at least one team member must attend the pizza party kickoff event from 5 to 7 p.m. Thursday in the Memorial Union Alumni Lounge. More detailed informations can be found online. Please encourage students to register a team today. Applications for summer 2019 PHF Graduate Assistantships are due no later than 4 p.m. Thursday, Feb. 28 to the Graduate School. Email applications to gradschool@mtu.edu. Instructions on the application and evaluation process are found online. An information session to discuss how to prepare a successful application will be held at 1 p.m. Wednesday, Feb. 6 in Admin. 404. Priority will be given to students originally from Houghton, Keweenaw, Baraga or Ontonagon counties. Non-resident students and international students are encouraged to apply if their health research is applicable to health needs and job shortages of our local community. Applications for summer 2019 finishing fellowships are due no later than 4 p.m. Tuesday, Feb. 26 to the Graduate School. Email applications to gradschool@mtu.edu. An information session to discuss how to prepare a successful application will be held at 1 p.m. Wednesday, Feb. 6 Admin. 404. The Graduate School anticipates funding up to ten fellowships with support ranging from $2,000 to full support (stipend + tuition). Students who receive full support through a Finishing Fellowship may not accept any other employment. For example, students cannot be fully supported by a Finishing Fellowship and accept support as a GTA or GRA. For departments looking for gifts for their graduates, donors or significant visitors, look no further than the beautiful Friends of the Michigan Tech Library blanket. Or, for those thank you notes, consider the Library Archives notecards. Both are available to be ordered online at the Friends of the Michigan Tech Library website. The blanket is just $65 and is 100 percent cotton; the notecards are $12/box and feature historic scenes from the Keweenaw. We can have them delivered to your office and we can bill to your P.O. All purchases support the Michigan Tech Library. Join Housing and Residential Life and the Center for Diversity and Inclusion in the official grand opening of the Connector Space from 3-4 p.m. Friday (Jan.25) in Douglass Houghton Hall (DHH) main lounge. The Connector Space is an expression of Michigan Tech’s commitment to celebrating and promoting diversity, equity and inclusion. Through programs and events, this space will bring our community together to engage with different perspectives, identities and experiences. This space should be used to share ideas and learn from, and with, one another. By engaging across perspectives, identities and experiences, we promote community development and social change. Join us for a few opening remarks and learn how you can reserve the space. Snacks will be available as well. To better serve our customer's needs, the Office of Innovation and Commercialization is now located on the second floor of the Lakeshore Center. In addition, the Office of Research Development has re-located to the Advanced Technology Development Complex (ATDC). Visit the research staff listing to view the new office locations of the Innovation and Commercialization and Research Development staff. Due to the recent relocation of staff/departments to the Lakeshore Center, designated Michigan Tech parking spaces have become very limited throughout the day. As a reminder, parking is free for two hours in the adjacent city lots. If you are visiting or attending a meeting for less than two hours at the Lakeshore Center, please utilize this parking first to allow those with offices there to park in the Michigan Tech permit lots. The Pavlis Honors College welcomes Sigrid Resh as coordinator for our undergraduate research programs. Resh will assist with the management of the Summer Undergraduate Research Fellowships (SURF), the Undergraduate Research Internship Program and the Michigan Space Grant Consortium submission and evaluation process. Resh’s own research focuses on the importance of wood contributions to soil carbon pools and fluxes, as well as soil sustainability and land use. Resh will also play an important role in the annual Undergraduate Research Symposium which highlights amazing research being conducted on campus by some of our best undergraduate students. Resh’s appointment with the Pavlis Honors College will be part-time in addition to her position as Research Assistant Professor in the School of Forest Resources and Environmental Science, Michigan Tech. The next Department of Electrical and Computer Engineering Seminar will take place from 2 to 3 p.m. Thursday (Jan.24) in EERC 122. Sukumar Kamalasadan will present "Recent Advances in Real-Time Modeling and Distributed Control of Modern Power Grid." Kamalasadan is a professor in the Department of Electrical and Computer Engineering and an associate of the Energy Production and Infrastructure Center at the University of North Carolina. He has published more than 160 research articles and attracted approximately five million dollars in research funding. His research interests include smart grid, micro grid, power system operation and optimization, power system dynamics, stability and control, and renewable-energy-based distributed generation. Michigan Tech Student Health and Wellness and the Outdoor Adventure Program bring you the Bigfoot Glowshoe event for the second year. The 22nd annual Bigfoot event will be held from 7 to 9 p.m. Thursday, Feb.7 at the Michigan Tech Trails. Proposals are being solicited for the Research Excellence Fund (REF) program, an internal award of the Office of the Vice President for Research. Budgets are due no later than 4 p.m. Thursday, Feb. 28 and proposals are due no later than 4 p.m. Thursday, March 7. Both must be submitted electronically per the guidelines. For additional information, see Research Excellence Fund. If you are interested in serving on an REF proposal review committee, email Natasha Chopp. Proposals are being solicited for the Portage Health Foundation (PHF) Mid-Career program, which is designed to support tenured faculty with an active National Institutes of Health (NIH) grant and/or consistent history of external funding with NIH or a related agency. For additional information, see Portage Health Foundation Research Awards. Tickets go on sale today (Jan. 21). Student tickets are $10 while non-students tickets are $15. For more information, contact aso-officers-1819-l@mtu.edu. The Office of Continuous Improvement is offering an Introduction to Lean workshop for Michigan Tech employees from 1 to 3 p.m. Thursday (Jan. 24) in Memorial Union Ballroom B2. For more information, read the previous Tech Today story. Want to know what's new with Google? Michigan Tech IT will continue to update you on the major changes, but you can always stay informed by checking out the Google blog. This is a great way to find out what is going on with Google Suite. Scott Wagner (SoT) is the principle investigator on a project that has received a $12,500 research and development grant from Michigan State University. Michael Morley (SoT) is Co-PI on the project titled "Self-Lubricating Bearing Prototype Using Novel Friction Stir Powder Metallurgy Process." This is a 15-month project.